Product #46608 | SKU 12296 | 0.0 (no ratings yet) Thanks for your rating! 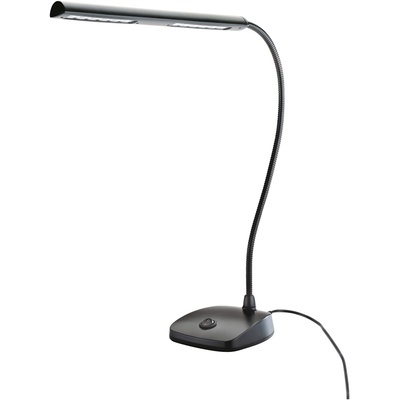 The black 12296 LED Piano Lamp from K&M is a 12 LED, 2500 lux, flexible gooseneck light designed to illuminate keyboards for applications such as live stage, home, rehearsals, live theatre, and more. It features a heavy base to ensure stable positioning. The goose neck is 16" (40.6 cm) in length. This 12296 Piano Lamp's LED technology provides long life and low energy consumption. An AC power adapter is also included.